For those of you that weren’t turned on by the top 5 phones from O2, Vodafone, Orange or T-Mobile, maybe a little something from Three will interest you? This week we’ll roundup the best phones available on Three right now, starting with a device that has now appeared in all four roundups so far: the Samsung Galaxy S II. That’s right: the Galaxy S II has now been the number one handset in all four of our U.K. carrier roundups so far, and that’s not because we like repeating ourselves — it’s because right now there’s no better handset available. Period. Why? It boasts a stunning 4.27-inch super AMOLED display, a super speedy 1.2GHz dual-core CPU, an 8-megapixel rear-facing camera, and a 2-megapixel front-facing camera — all packed into a slender 8.49mm-thick device. 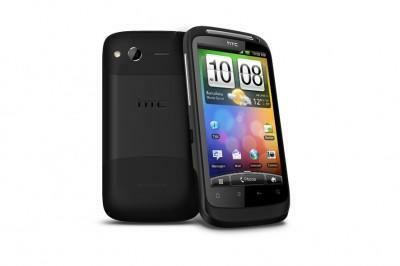 If you’d prefer to stick your money on a HTC handset, rather than that from Samsung, then the HTC Sensation is currently the best available on Three. Like the Galaxy S II, the Sensation packs a 1.2GHz dual-core CPU, a 4.3-inch qHD display, and an 8-megapixel camera with auto-focus and an LED flash. Not to mention the awesome HTC Sense UI. While some people see it as a gimmick, others — like me — are a big fan of 3D. The first (and only!) 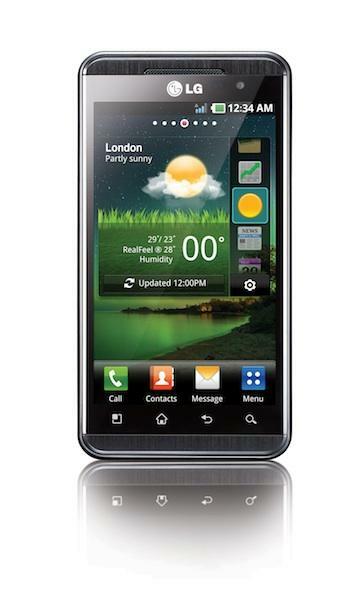 3D handset available on Three is the LG Optimus 3D, but it isn’t just its third-dimension that makes this device a must-have. In addition to the 4.3-inch 3D display, this device features a 1GHz dual-core processor, 512MB of RAM, 8GB of storage, and a 5-megapixel camera with 1080p video recording. If the first three Android handsets are a little out of your price range, maybe the fourth will get you spending. 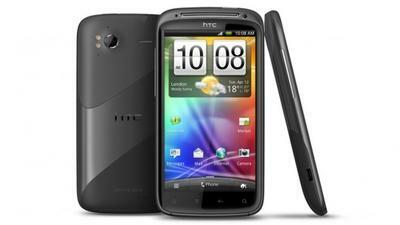 The HTC Desire S is both good on your wallet, and good on specs: it sports a 3.7-inch S-LCD display, a 1GHz processor, 768MB of RAM, and a 5-megapixel camera with 720p video recording. 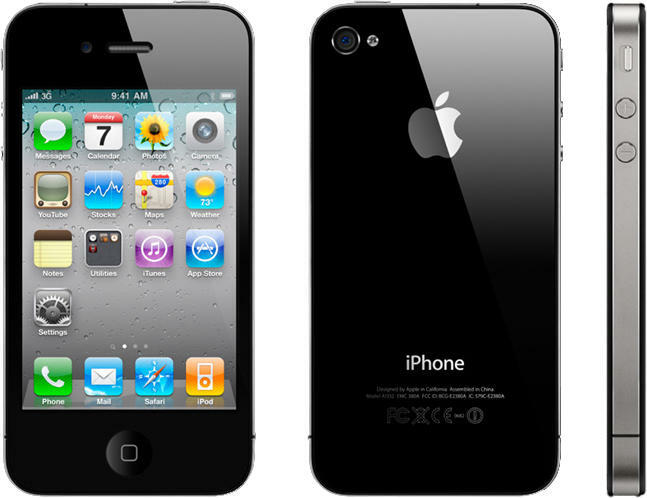 Like the Samsung Galaxy S II, the Apple iPhone 4 has featured in all four of our top 5 phone roundups on U.K. carriers so far. It’s getting a little old now, but it’s still one of the greatest smartphones available, featuring Apple’s snappy A4 processor, that stunning Retina display, 512MB of RAM, and a 5-megapixel camera with auto-focus, LED flash, and 720p video recording. And, of course, it runs Apple’s unbeatable (for some) iOS operating system. That concludes our roundup of the top 5 phones on Three. 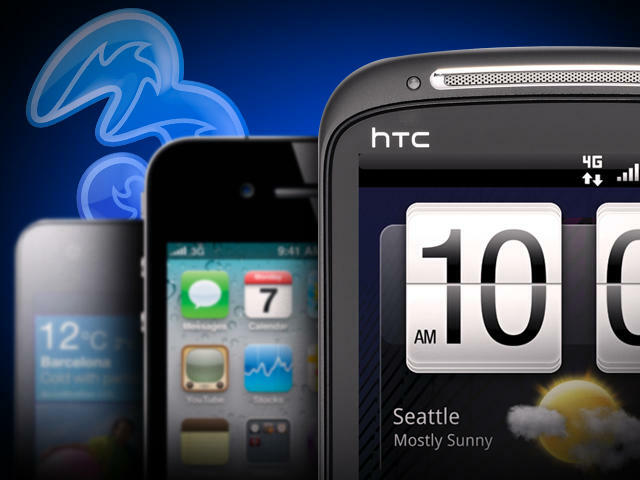 However, we’re sure these devices will change a little with the upcoming release of the HTC Titan, the Sensation XE, and that long-awaited iPhone 5. What’s your favorite Three handset?